Meditating at Komyozenji in Dazaifu, Fukuoka. 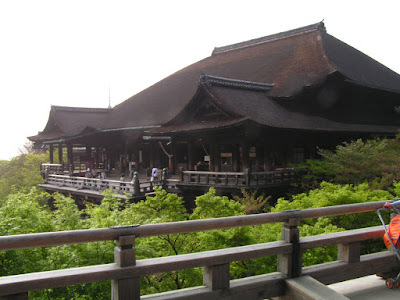 Click here to read about this Zen Temple. We used public transportation except 2 days in a chartered micro bus. Food and beverages (including beer) are available on long distance express trains. 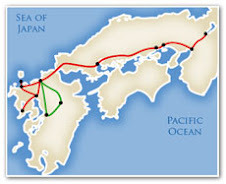 We also use the Shinkansen(Bullet Train). Miyajima Tori Gate (53 feet high) in water, UNESCO World Heritage site. You can walk to the gate in low tide. 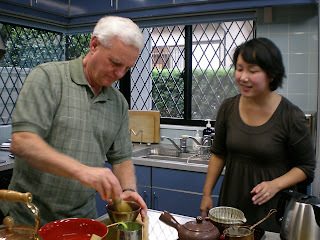 Exclusive visit to a private residence for an informal tea ceremony mixing green powdered tea with hot water using a bamboo whisk. Nishiki Market is a Kitchen of Kyoto. A long street of various goods; food, tea, knives, flowers, small restaurants etc. Click here. Just below Mt. Aso active volcano, this 150 year old inn sits high on a nearby mountain. There are 7 outdoor hotspring bathing areas and 4 indoor. Mineral rich hot spring water cures many ailments. Bathing in Japan is not just for cleansing but for relaxation as well. Click here to learn more about hot spring bathing (Onsen). About 20 different varieties of organic food are served. Menu varies according to season. This road is so narrow that our micro bus couldn't turn around thus a short walk was the only way to get there. It felt good to walk after a huge wholesome organic lunch. Giant old wisteria vine at Karatsu Castle. This is a 14th generation pottery studio. Their pots are made with clay dug on their own property. Unique experience grilling your own fish, meat and veggies. Yoichi Nakamura, reed artist, showing us how to use a reed pen for drawing. He's one of the very few reed artists in Japan. 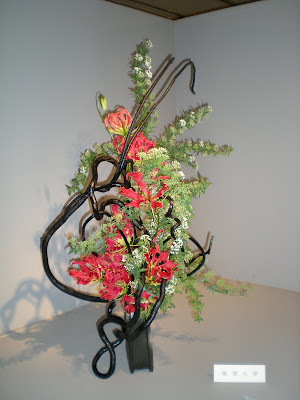 He harvests reeds, dries them about a year and shaves them to make a pen for his artwork. We traveled to remote areas using this chartered micro bus for 2 full days. 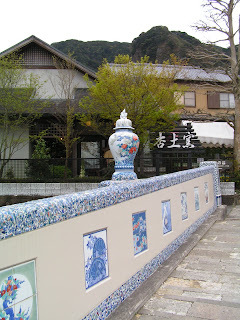 Over 50 kiln chimneys can be seen in the small pottery village of Ookawachiyama - Imari. When Shoguns changed power, Nabeshima, a local war lord, kept his position and his life by siding with the new Tokugawa Shogun after being defeated by him. He moved the best potters from Arita to Imari and kept them prisoner in the gated community (steep mountains on 3 sides and only one gate). They produced and dedicated the best quality 17th Century porcelain to the Shogun. Morning Market (Asaichi) in Yobuko, a fishing town. With the growth of supermarkets in Japan these morning markets are disappearing. This island fishing village specialty is to shred daikon radish then boil and dry to preserve. Shipped all over Japan. 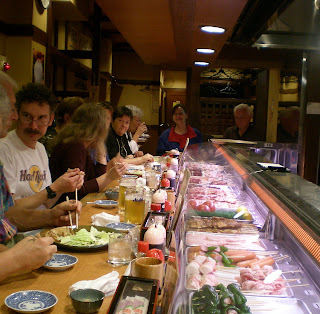 Eating yakitori at Nobunaga, a local Japanese grill, just a few minutes from the hotel. You pick your own choice of meats and veggies for grilling. Shochu is a great drink. 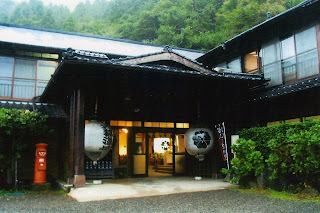 One of seven outdoor onsen (hot spring baths) at a 150 year old inn. Bathing in Japan is not only for cleansing but also for relaxation. Bathing is optional. This temple was built without using a single nail. Click here to learn more about this UNESCO heritage site. Nijo Castle, Kyoto. Unesco World Heritage site. In 1603 this is where the Tokugawa Shogun declared his sovereignty over Japan. The Tokugawa family Shogunate held power until the Modern Meiji era began in 1868. Unique squeaking "nightingale" floor. 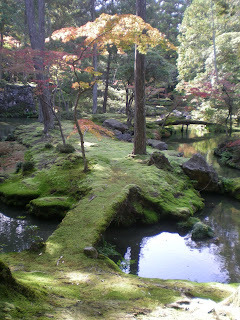 Ginkakuji (Silver Pavilion) garden is my second favorite garden in Kyoto. Sand sculptures are impressive. It is said that at night with a full moon shining on the sand, it's like a beautiful silver sea. Maiko is a Japanese word for dancing girl. A Maiko is an apprentice geisha. Their work begins from dusk. Final stage to put a long Obi (sash) on Kimono. 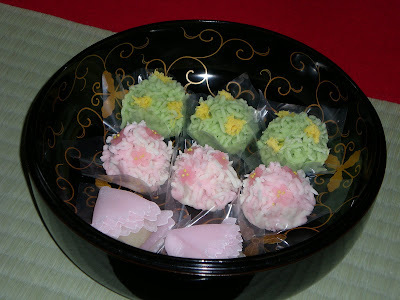 You must have sweets (wagashi) before you have tea. The blend of sweetness with the bitterness of green tea creates beautiful harmony in your mouth. 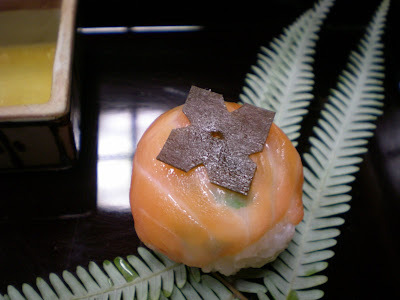 Culinary art; sushi made of salmon, konbu (sea vegetable), wasabi and rice to resemble a persimmon. Seafood salad is artfully presented. Japanese food is visually beautiful, "eat with your eyes".